2019 is here and It’s the year I want to visit the Philippines. 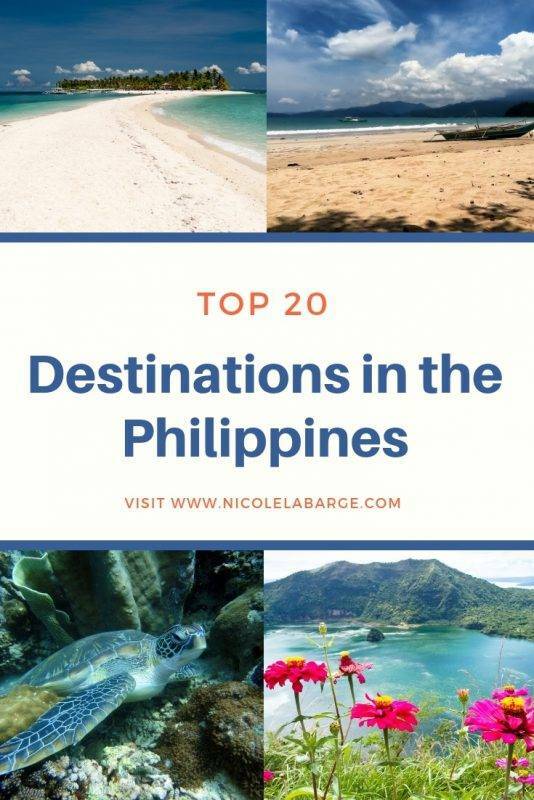 I have put together the top 20 tourist destination to visit in the Philippines with the help of some of my blogger friends. The Philippines has over 7,000 islands to choose from so where to start? I asked other travel bloggers what are the best islands to visit in the Philippines and put together a list of the best islands. 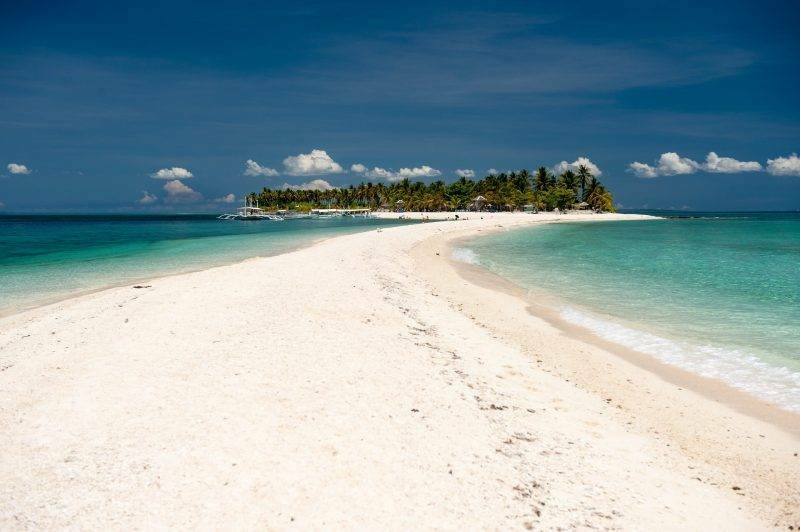 These Philippines destinations are known for their beautiful beaches and islands. This is the beautiful sceneries in the Philippines that you see. I’ve put together the most beautiful and epic places to visit in the Philippines. 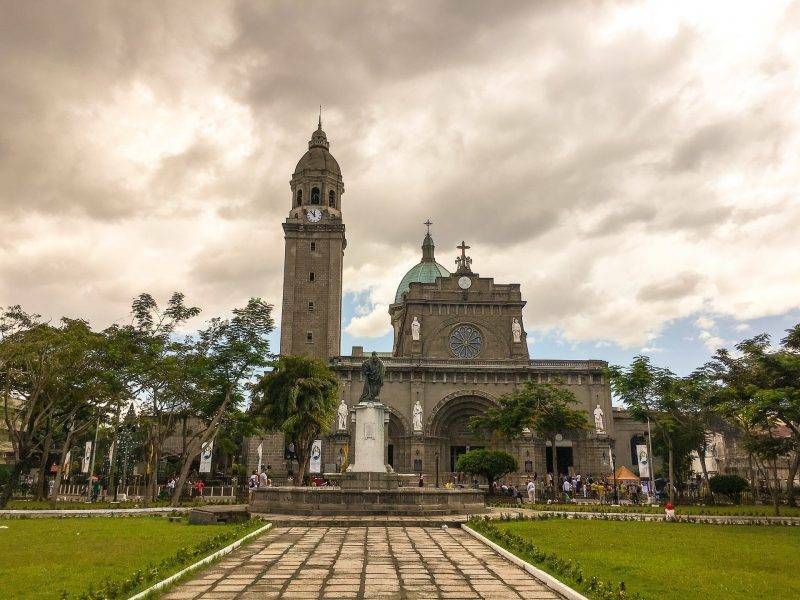 To help you with your travel plans to the Philippines we have put together a list of the top 20 tourist destinations to visit in the Philippines. Here we go! I have wanted to go to Boracay Island for years. This will be my first stop when I visit the Philippines. The island was shut for six months to improve the infrastructure of the island for all of the tourists. 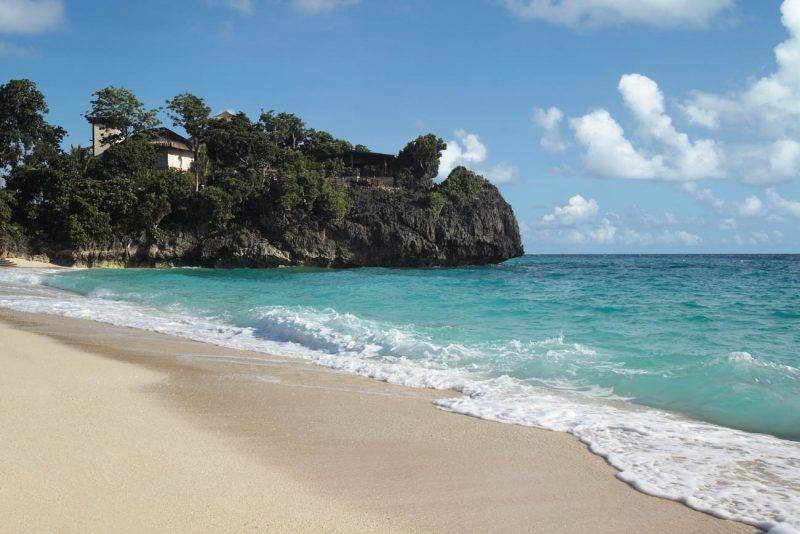 Boracay boasts some of the most beautiful beaches in the world! Here are the new rules for Borocay. Siargao was our favorite island in the Philippines. It’s located in Surigao del Norte and you can get to Siargao by plane from Manila, Cebu or Clark Airport. We spent 2 weeks in Siargao and we loved the island hopping in Siargao Island. We aren’t surfers, but most of the people go to surf in Cloud 9. Our favorite was enjoying the island hopping around Daku Island, Naked Island, and Guyam. By just renting a boat, you can visit these 3 islands and spend your whole day island hopping, swimming or just enjoying the sun. Apart from the main islands, you can also do day trips to Sugba Lagoon and Sohoton Cove Natural Park. We highly recommended visiting them because of the epic views. 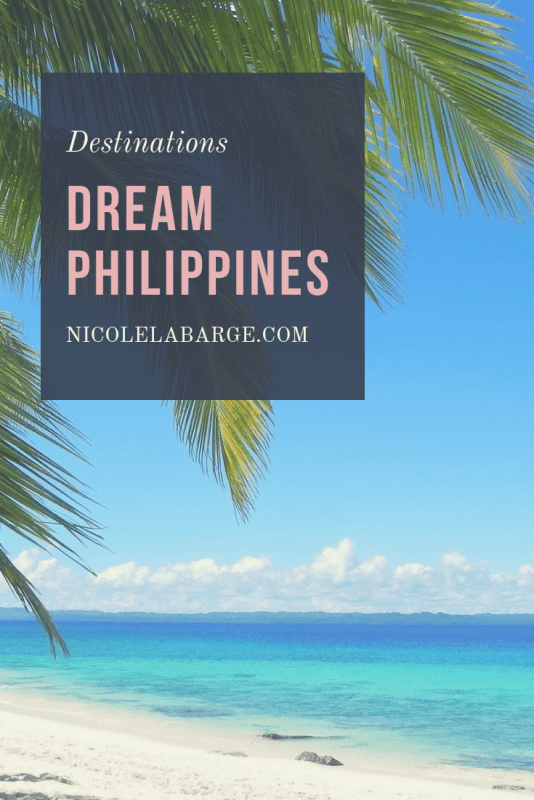 Other plans to do in Siargao is renting a motorbike and going to the Northern part of the island where you can enjoy the beaches for yourself. You will find almost nobody around the area. Pacifico beach and Alegria beach were our favorite beaches in Siargao. Another experience you shouldn’t miss us the nightlife in Siargao. There are a few places where you can go for a drink after dinner. And you can find foreigner and local choices for dinner, both restaurants and drinking bars. If you are heading to Siargao, we recommend you book your accommodation in advance so you can choose the type of accommodation you want, whether you want to backpack and spend a little or if you have a little bit more room to spend more. There are options from small shared bunk beds to very lavish barefoot luxury accommodations. Cebu is one of the most diverse and enchanting islands in the Philippines. It’s full of spectacular diving opportunities, friendly people, and beautiful waterfalls like the famous Kawasan Falls. We recommend booking a hotel in the quaint little beach town of Moalboal. There you’ll find numerous dive shops offering daily dives where you can see thresher sharks, sea turtles, and maybe even a whale shark if you’re lucky. The best dive in the area is the Sardine Run where you’ll be surrounded by a school of thousands of tiny sardines. Moalboal also offers the perfect base to explore the surrounding area. Kawasan Falls is just a short motorbike ride down the road. 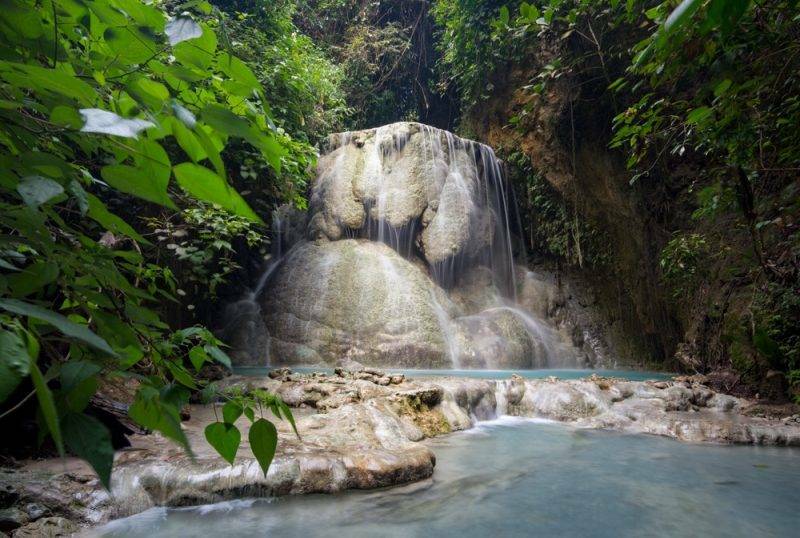 Known for its picturesque turquoise water and bamboo rafts, Kawasan Falls is a photographers dream. But if you’re up for a little more adventure you should take a canyoning tour. You’ll start at the top of the canyon and work your way downstream by jumping off of cliffs, sliding down natural waterslides, and floating through caves. The final jump is a heartstopping 40-feet! (But don’t worry, you can skip it if it’s too much to handle). Kawasan Falls is just the start when it comes to adventure in Cebu. The entire island is covered in hiking trails that lead to spectacular waterfalls and refreshing swimming holes. Make sure you check out Dao Falls, Aguinid Falls, and Inambakan Falls. And if you continue around the southern tip of the island you’ll also have the opportunity to snorkel with Whale Sharks in the town of Oslob. You’ll have the time of your life on Cebu Island! Palawan island can be found in the western Philippines and is known for its stunning beaches, adventure activities, crystal clear water and biodiversity. One of the most popular destinations on Palawan Island is El Nido and it is easy to see why. El Nido has previously won awards for being one of the most beautiful places in the world. This is unsurprising once you visit and experience a day out exploring the nearby coves, beaches and snorkelling spots, it is simply beautiful. 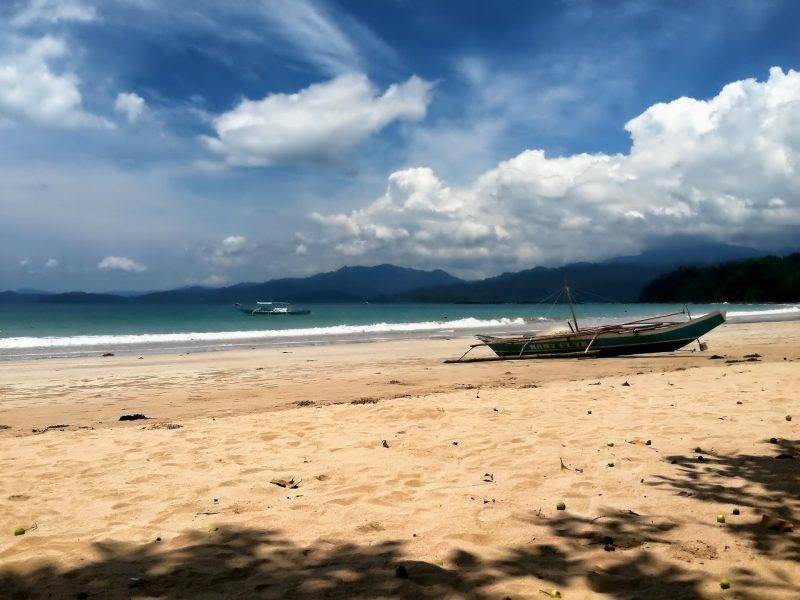 When is comes to beaches, Palawan has a lot to offer but if you have limited time we recommend that you head straight to Nacpan beach. This is a wide, long stretch of white sand and has some of the clearest waters we have ever encountered. Getting here can be a bit of a journey but it is well worth it. The capital of Palawan is Puerto Princesa and you should definitely make time for here. In Puerto Princesa you can experience the Puerto Princesa Subterranean River National Park and be taken through underground caves by boat, this is quite the adventure! The Philippines has so much to offer, but for us, Palawan is one of the best islands of all! With the rise in popularity of the Philippines, it’s reassuring to know that you can still find hidden gems. Whilst word is starting to spread about Siquijor, at the moment it is still refreshingly quiet and is the perfect island to slow down the pace. It’s the kind of place where you plan to go to for a few days and end up staying for two weeks! It is blessed with some beautiful beaches, our favourite being Paliton where you can lie on the white sand beneath the swaying palm trees. Siquijor is famous for its stunning sunsets and Paliton is the best place on the island to watch the sun slowly set below the horizon. If you want a break from the beaches stop by Cambugahay Falls, a multi-level waterfall with dazzlingly bright blue water. It’s perfect for a chilled-out swim or if you’re looking for a little adrenaline rush one of the two tarzan swings! For more adventure, head to Salagdoong beach for a 10-metre cliff dive. The water here is a deep blue and even if you don’t fancy doing the dive yourself, it’s fun to watch people muster up the courage to make the leap! 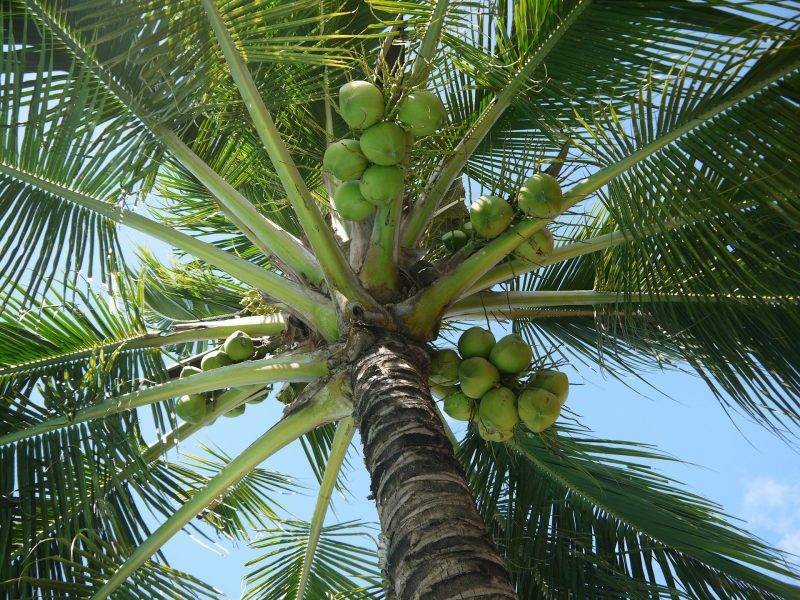 The thing we love most about Siquijor? It’s the vibe. The people are extremely friendly, it’s blissfully quiet and there is no traffic. You can get away from the crowds, but still have plenty of interesting things to do. Kalanggaman is a tiny islet located off the coast of Palompon, a city in the Leyte Province in the Philippines. It’s uninhabited and you have to arrange a boat in the Palompon Tourism Bureau to get there. And it takes 40 minutes! Still, though, it’s well worth it. I’ve never seen such a beautifully secluded and pristine little island. There’s a long sandbank running on one side of the island, with the other half covered in coconut trees. The water here is crystal clear, all shades from turquoise to the dark blue further away. The sand is white and pleasant, even though not as soft as you’d expect. Kalanggaman, like most of the Leyte Province, suffered greatly from the rampage of the tropical storm Haiyan in 2013. While the island was nearly wiped out, local authorities managed to clean it up quickly and work on restoration. When I visited Kalanggaman in 2016, there were already functioning bathrooms with showers, and a treehouse was being built. There are no mosquitoes and hardly any mobile signal. You have to pick your own trash and bring your own drinks and food, but you can even stay overnight. Kalanggaman is a little piece of paradise. Of all the places we have visited in the Philippines, Coron is the one place we keep going back to time and time again. In my opinion, the sheer amount of natural beauty and ways to explore it are what makes Coron the best island to visit in the Philippines. 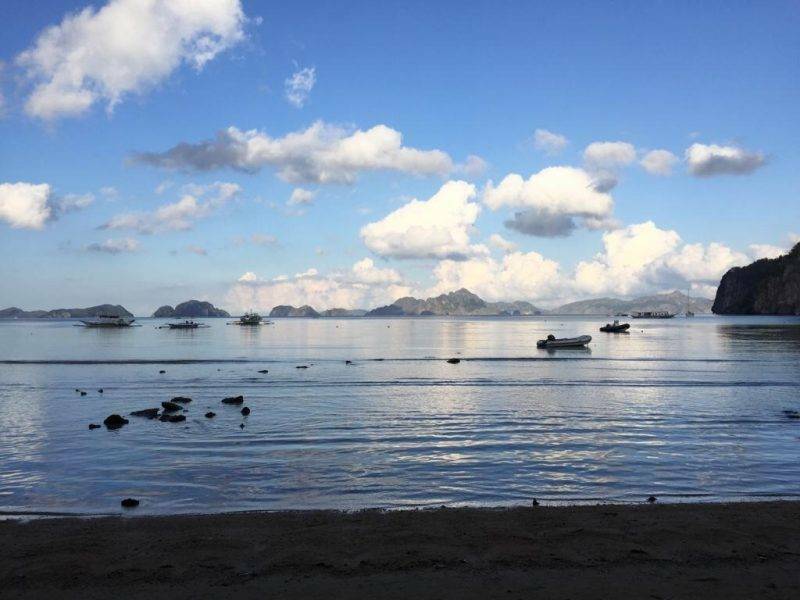 This region is comprised of the main island of Busuanga, where you can find the hub Coron town, the actual island of Coron and a large amount of stunning satellite islands. 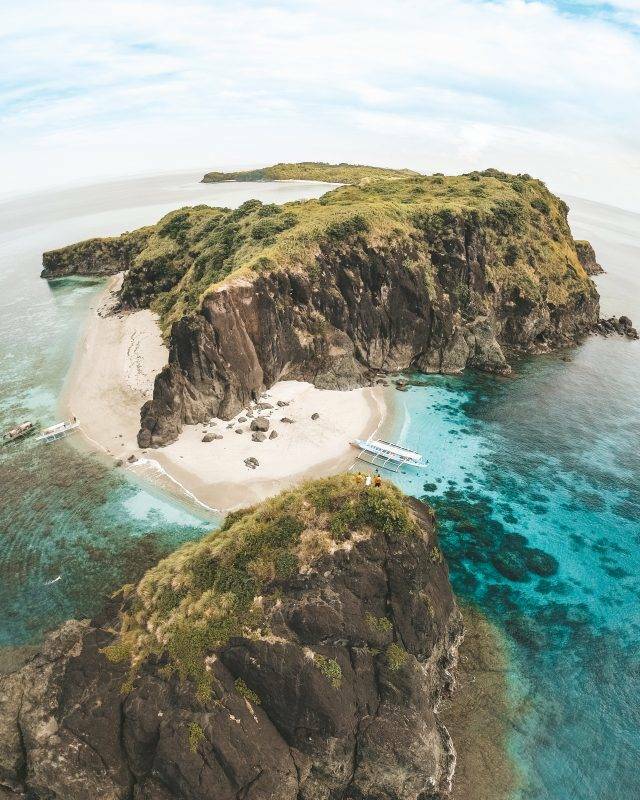 These islands sit among WWII shipwrecks and pristine marine reserves that are full of coral, making the area a top spot for scuba diving and snorkeling. The island of Coron is home to many unique lakes that sit high above the waterline. 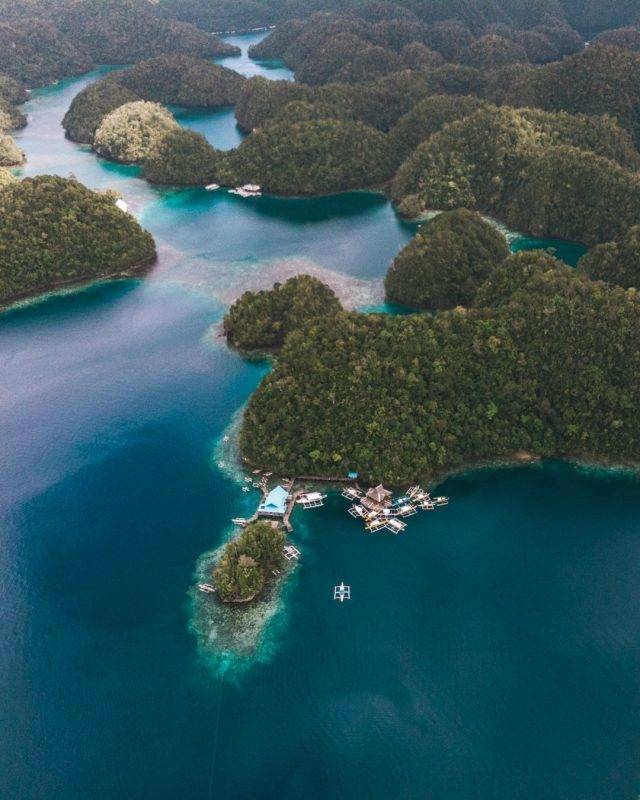 These lakes are sacred to the local tribal people, but they allow tourists in to both Barracuda and Kayangan Lake. The entire area surrounding Coron is known as a world class kayaking destination and a place where you a truly get off the beaten track, if you want to. If you choose to base yourself in Coron, you have endless possibilities to explore the area by taking day trips that go island hopping, snorkel trips that visit shipwreck sites, jungle trails for hiking and 4×4 trips into the Busuanga backcountry. This makes Coron a diverse destination and one that you shouldn’t miss on a trip to the Philippines. Bohol is definitely my favourite island in the Philippines, because it offers a great variety of things to see and do. Are you looking for beautiful beaches? You can head to Panglao, which technically is a separate island linked to Bohol by a causeway, but it’s so convenient to access that it is usually treated as a part of Bohol itself. Are you looking for lush nature? 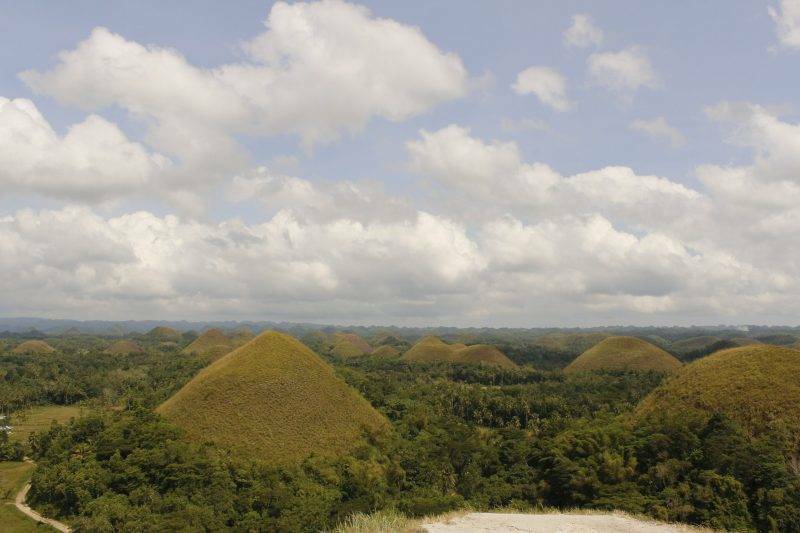 Head to the centre of Bohol, where you can see the famous chocolate hills, taking their name from the fact that their shape resembles Hershey’s kisses. 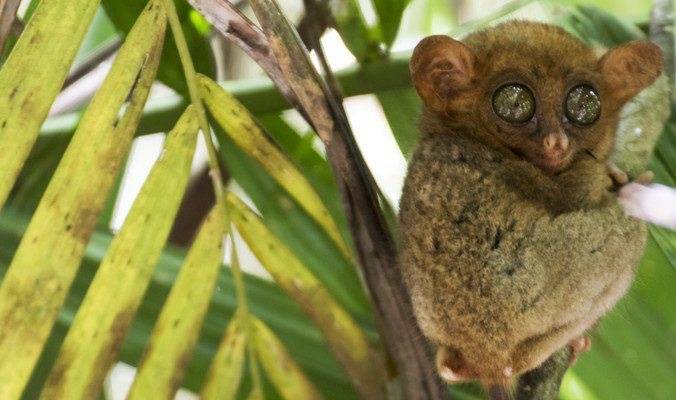 Nearby you can also visit the Philippines Tarsier Sanctuary, a nature foundation housing a number of tarsiers, small and impossibly cute animals, which are severely endangered after being snatched from the wild. Be sure to visit the Philippines Tarsier Sanctuary, which aims to give a home to orphaned and injured animals, not one of the for-profit copycats taking tarsiers from the wild to be taken as props. Yet, this is not all! Other Bohol highlights include flooded caves where you can swim, wonderful dive sites and the Loboc river, where you can go paddleboarding or have a ‘floating lunch’ surrounded by live music. There’s so much to see and do, that even one whole week in Bohol is not enough! APO Island in Dauin, Negros Oriental is one of the best islands in the Philippines. Hence, its marine habitat is protected with more than 500 documented species of fish and corals that’s why divers and snorkelers never missed visiting the place. It is home of the massive turtles and this is what made them one of the famous islands to visit. 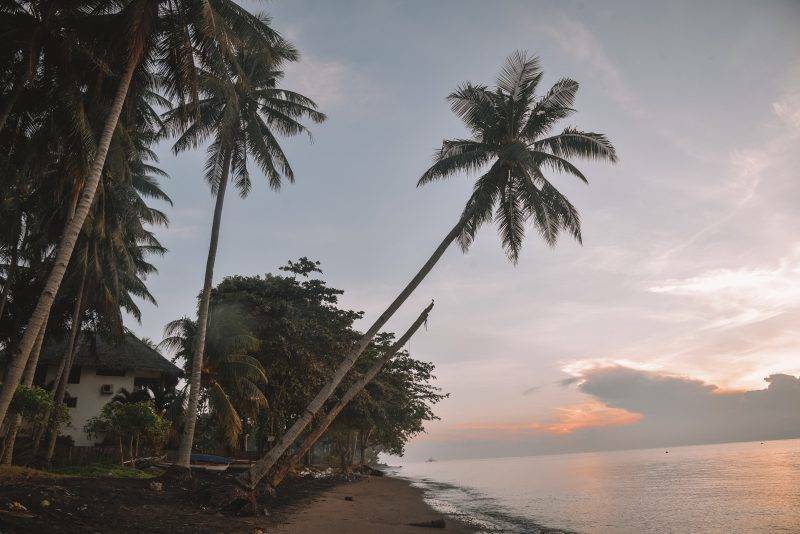 Apart from being one of the best diving sites, the experience of staying with the locals can give a different feeling from interacting with them, not because it’s a touristy area but people are so welcoming regardless if you are a local or foreign tourist. With a few hours of electric power in a day and an intermittent connection to the internet, one can be able to explore deeper what the island can offer. Climbing to their rock point view deck area shows the best spot for a stunning sunset of the country while watching over the different rock formation of the island. It has a one known site of a rock formation that one can have a great time chilling. One of the reason as well is that the island and its people are now doing their best to maintain and improve the sustainable livelihood especially that locals are now working hand in hand to build a clean environment. 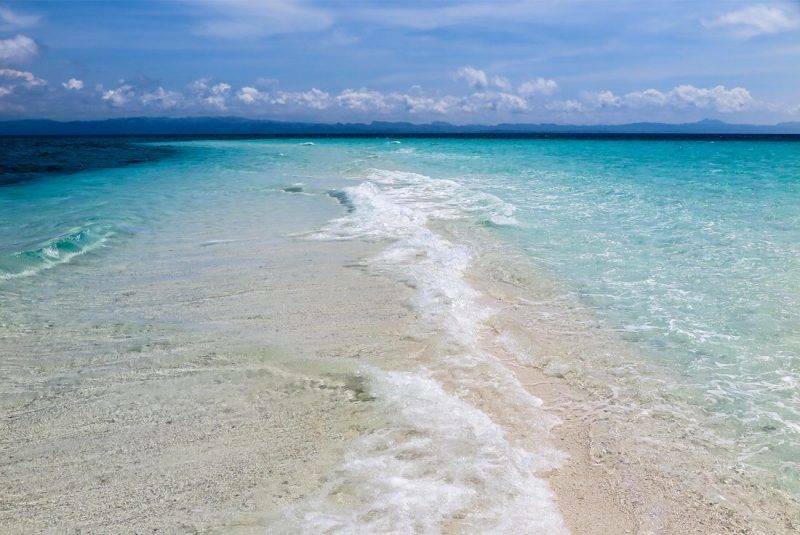 One of the best islands in the Philippines is Samal Island. Accessible by boat and ferry, you would fly into Davao first to get there. 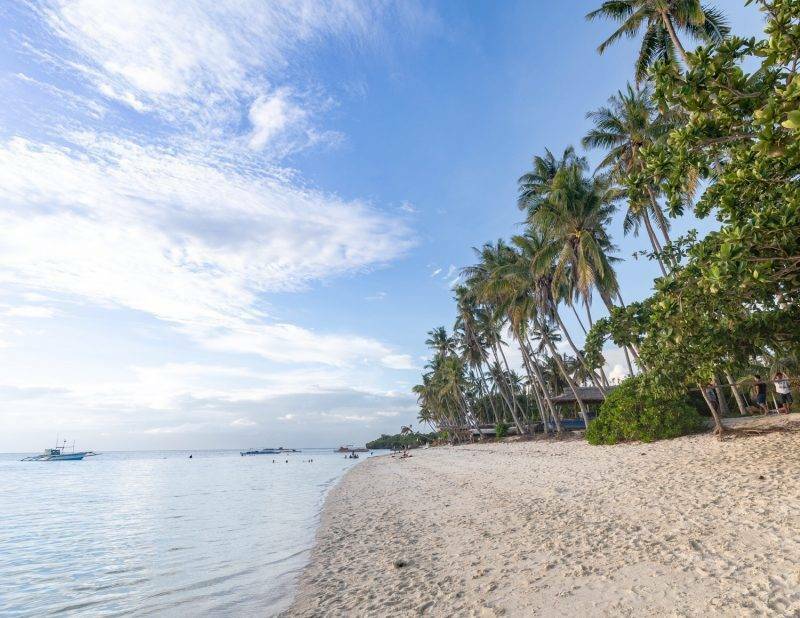 While it is not as big or popular as some of the other notable islands among the 7,000+ that make up the Philippines, Samal is bursting with beauty. The best place to stay on Samal is Pearl Farm Beach Resort. This luxury property offers over water huts along the coast line and a smaller, more intimate island off of Samal with large homes on the coast and a private beach. The hotel boasts a beautiful infinity edge pool overlooking Mount Apo and the Davao Gulf. 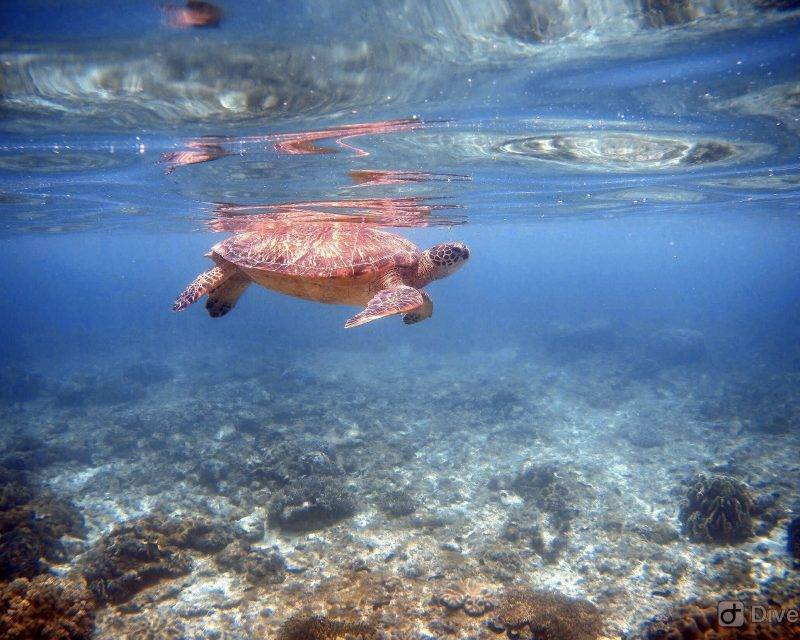 One of the top activities for the resort and island is snorkeling over the clam sanctuary off the coast. This area is protected and the clams are extremely large. You won’t see anything like this on the other islands. 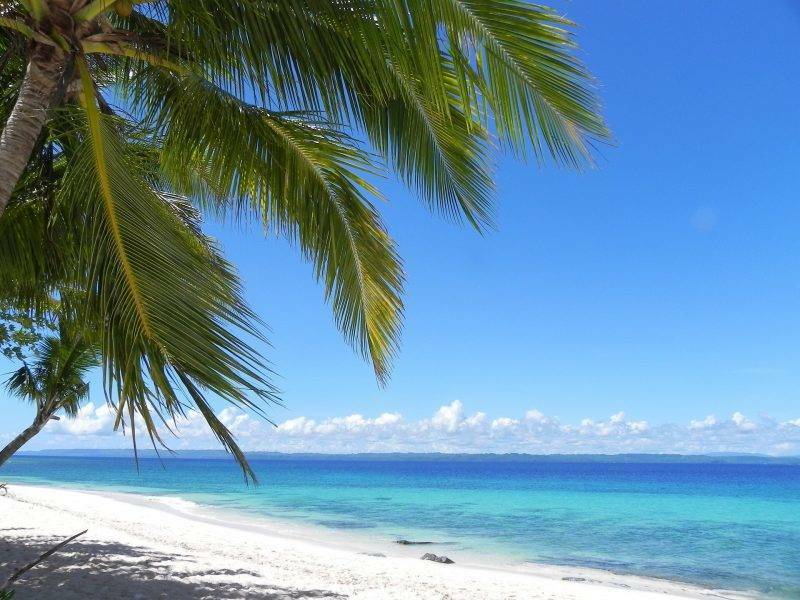 Malapascua is a small island situated in the Visayas. The main attraction is the nearby dive site, Monad Shoal,where you can spot Thresher sharks daily. This is the only known place in the world where you can expect to see these sharks regularly. The Thresher shark is nocturnal, and normally hunts on extreme deep waters, so if you want to spot them, you have to get up really early. This is when the sharks come up to about 30 meters depth to clean themselves. A small fish called Cleaning Wrasse eat dirt and dead skin off the Thresher sharks, so this site kind of works as a cleaning station. Except diving with Thresher sharks, it is great for snorkeling and there are plenty of dive sites both for beginners and experienced divers. The main beach is full of dive centers, but if you want it a bit cheaper, there are a couple of good priced ones further in on the island. If you don’t dive, there are some splendid beaches and you can walk around the island by foot exploring the market and the local life. The island has plenty of good restaurants, also for the budget traveler. Other popular attractions on Samal Island include visiting Monfort Bat Cave in Babak where over 1.5 million fruit bats live, scuba diving, beach hopping, boating, and taking in the fabulous Filipino hospitality! Samal is definitely the island where you go to relax and do soft adventure activities for your holiday getaway. 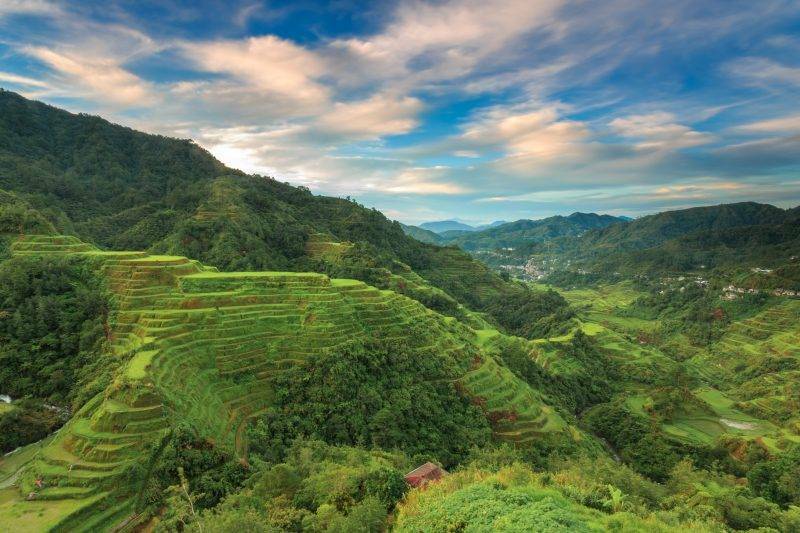 The Banaue Rice Terraces are rice terraces that have been carved out of the hillside. These rice terraces are a UNESCO World Heritage Site. It is beautiful to see the lush, green rolling hills in this area. The lush rolling hills and rice terraces are located north of Manila. Bicol Region is the southern part of Luzon and is known for its Spanish Colonial buildings and beautiful coasts. 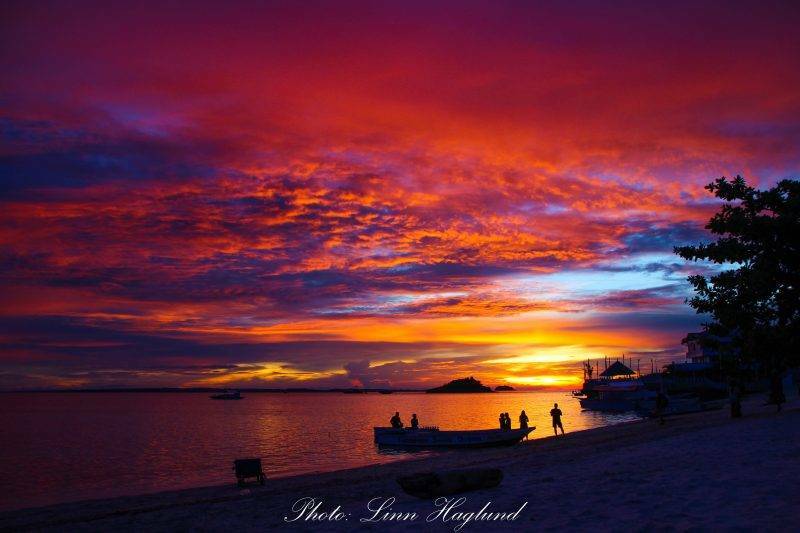 It is a beautiful area to relax and get away from the crowds and enjoy some epic sunsets. Named a UNESCO World Heritage Site, Tubbataha Reef off of Palawan is an amazing place to go scuba diving and see the reef and fish. It is named one of the best places to dive in the world and a good location to see sea turtles and manta rays along with lion fish and sharks! The unique landscape and highlands of Batanes is completely different from the rest of the Philippines and makes it a sought after destination. Surigao del Sur is something you must see to believe. The crystal clear waters are worth the trip. No one know exactly how they got their name but they do look like chocolate with the sun cascading over the hills. A sight to see. The caves on Sagada are a highlight and the whole island is a bit of a backpacker hangout. 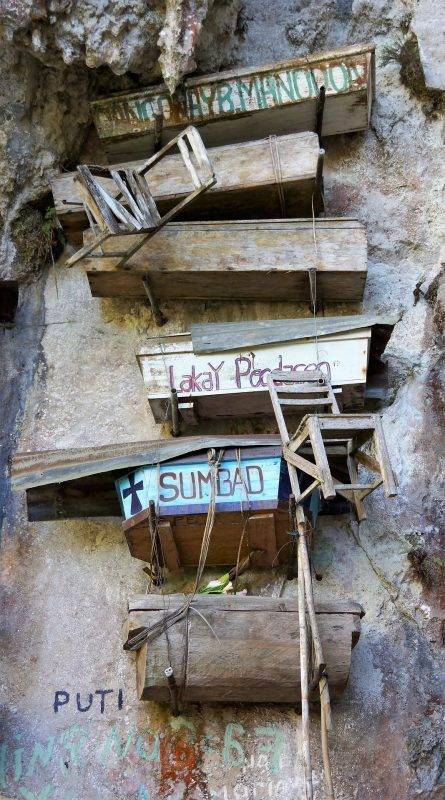 These caves hold hanging coffins which you can go and see. You can also enjoy caving and visiting waterfalls on the island. The main reason to come to Iligan is for the waterfalls. There are so many waterfalls here including the two tier Limunsudan Falls. Manila does not get enough credit. There are so many things to do and see there that it is worth a stop over. Plus all of the food you can try there as well. And that completes our list of the top 20 destinations to see in the Philippines. What’s your favourite place to visit in the Philippines? Coron and El Nido are on my list since long – I love the Palawans. However I love the list that you have mentioned. I would like to know is the Boracay open? It was closed due to masstourism. Do you have any latest information about the island? 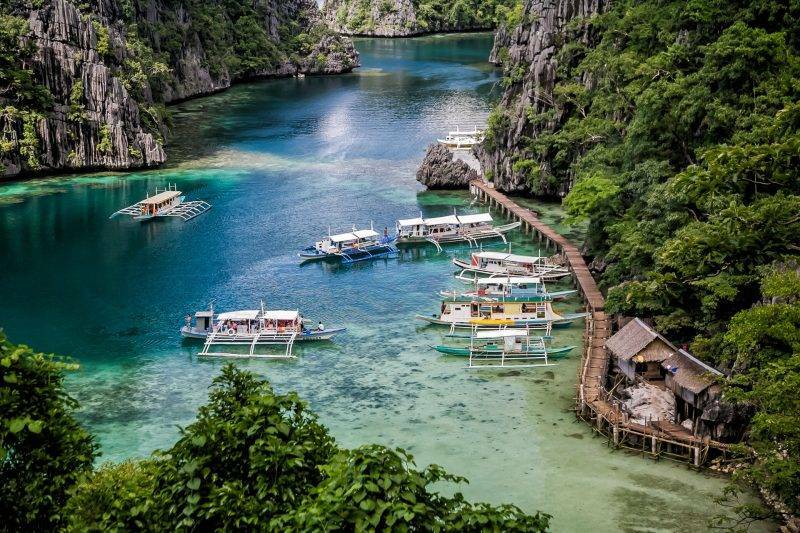 The Philippines is definitely on our travel wish list. So many spots. Top for me would be Boracay beaches, the many islands around Siargao, the blue waters of Corn Island, snorkelling with turtles on APO Island and scuba diving on Malapascua Island. Great to get input from so many travel bloggers. An impressive collection of beautiful places in the Philippines most people have probably never heard of. 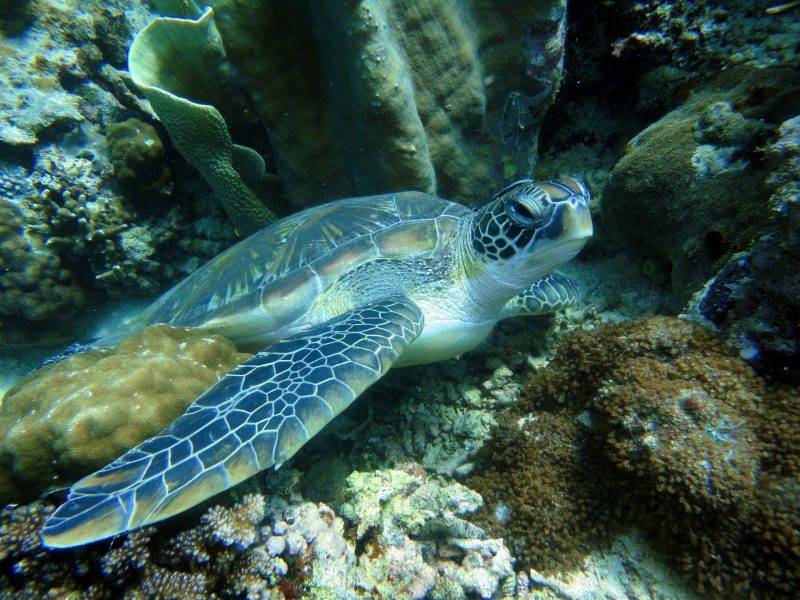 I’d love to swim with turtles around APO Island and the Banaue Rice Terraces would be amazing to see. The Philippines is also on our bucket list. We wanted to go this year, but since the weather is not quite nice in summer, we prefer to wait a few more years. My family members were stationed in a tiny island in the Philippines in the 1970s (they were boat people fleeing the Vietnam war), so I’d like to go there someday to see where their camps were. Not sure if this place can be visited or not, but we’ll see… Other than that, both Boracay and Kalanggaman islands seem to be very beautiful. It’s a great idea to ask for fellow travel bloggers to give their suggestions before going somewhere. We did that do for China that we’re going to visit this summer. Thanks for sharing this inspiring post! So proud of all these top destinations. I was surprised to find out that I have only been to 7 of these! Shame on me, a Filipina. I visited El Nido, Coron and Boracay on my first trip but was disappointed that I had only a week and could not do more. I plan to return to The Philippines at least 3-4 more time and on the next trip, I am definitely including Siargao, Cebu, Kawasan Falls and Bohol chocolate hills. Thanks for the inspiration, I will be left with so much more to explore even after that! Philippines is a blessed country to have all these natural stunning places to visit. So many places to visit and it is really difficult to select one over the other especially if we don’t have long holiday plans. Nevertheless this list makes it easier to choose from. Thanks for that. What an impressive collection of beaches. The Philippines islands are incredibly beautiful. High on my list would be Boracay and the Chocolate Hills. Great inspirational list and can’t wait to lay on those beaches. One thing I hope has improved: PAL – the local airline! Back then they were called “Planes Always Late”. We had flight leaving from Cebu back to Manila at 4pm. All locals told me not to go to the airport before 8pm (4 hours after planned departure). Well, we went around 7pm – and had to wait until past midnight before our plane left. Of course, nobody would let us in into our pre-booked hotel in Manila, so we ended up in a hotel by the hour (if you know what these places are like…). I love love love – The Philippines! and so happy I had the opportunity of sharing about APO Island. These destinations are really one of the best in the country, I can vouch for them all. Thank you, Nicole!